The know-how and experience gained in our specialised domain of manufacturing flow meters have been used in the development of a new a high-performance Coriolis flow meter capable of directly measuring mass flow rate with high accuracy. High accurate measurement is also possible for the purpose of large mass flow measurement. Ultra-high pressure type available also, see product pdf for details. Exceptional accuracy (±0.1% ±zero stability error of reading for liquid service) and high sensitivity (measuring range 1 to 200). Accepts both liquid and gas. Measures accurately with small pressure loss over a broad flow range. Measures density and temperature accurately in addition to mass flowrate. Minimum pockets for the process fluid to stay (in vertical installation) offers ease of cleaning. Applicable to a widely varying kinds of process fluid thanks to stainless steel or Alloy C components. Lightweight and compactly built, yet exceptionally high mechanical strength. The result is ease of handling, installation space saving, and increased process safety. Explosionproof configuration permits meter installation in a hazardous location. 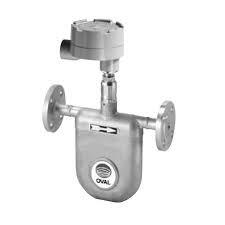 The ULTRAmass MKII is a general purpose mass flow meter with versatile application for liquids and gases.